People everywhere love Mickey Mouse! But coming up with a unique twist on a boy’s Mickey Mouse birthday party can be challenging. However, Carol Colon, of Partylicious, combined her client’s love of Mickey Mouse with The Three Musketeers. The resulting Mickey Musketeer party was magical — full of colorful balloons, festive decorations, fun party games and a Mickey themed dessert table. Wait until you see the birthday cake! 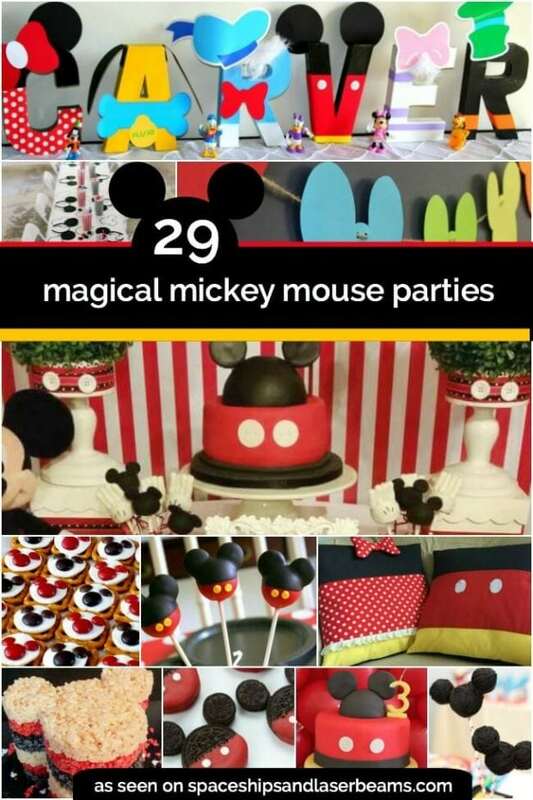 See Also: Combining Mickey Mouse + Pirates of the Caribbean is another unique party theme! The bright color palette made up predominantly of red, yellow and blue was vibrant and fun. Blue drapes were accented on each side by balloon art. A life size Mickey Musketeer grabs attention and a Goofy balloon creation depicts the age of the birthday boy. Check out that balloon sword and the feather hat accent! A medieval inspired “Happy Birthday” banner served as the table’s backdrop centerpiece and coordinated with a fleur de lis banner, which hung from the front of the dessert table. White platters were neatly arranged on the bright table linens and displayed gorgeous desserts. There were lemon flavored French macarons, fleur de lis shaped sugar cookies, chocolate covered Oreos (with fleur de lis accents), coconut macaroons and brownies. Notice how each dessert is beautifully displayed and has a custom food label. I love the thoughtful accents like the musketeer sword food picks used to dress up the brownies. Little details like this really help reinforce the party theme. Carol loves using the cake as a focal point on all of her dessert tables. Mary, from The Cake Factory, designed the spectacular three tiered cake for this Mickey Musketeer party. Look at how detailed the sugar art is; not only is the castle base impressive, but the sword, shield and Mickey hat are so on point. Darling cupcakes with Mickey Mouse picks and fondant fleur de lis toppers were a perfect complement to the cake. Sweet accent pieces like stacked paper suitcases, marquee style signs and a stuffed Mickey Mouse helped to finish off the table and provide a custom boutique party look. How about Mickey’s musketeer outfit?! Colorful children’s tables were set up for little guests pleasure. The tables featured centerpieces made from paper Mickey Musketeer cut outs. Attached to skewers, they were displayed in bright pails filled with paper shred. Each place setting consisted of a Mickey head placemat, polka dot plates, and water bottles wrapped in personalized labels with striped straws. A pair of Mickey ears completed each place setting perfectly. The spiffed up burlap favor bags look awesome. They included magic wands and tiaras for the girls and foam swords for the boys. I love the thank-you tags attached to each goodie bag. Cheery colors, plentiful desserts and winning décor choices made this a brilliant party. I’m sure the kids were grinning from Mouse ear to Mouse ear as they enjoyed this unique theme and play space.